You'll be £30.00 closer to your next £10.00 credit when you purchase The Twilight of Southern Steam. What's this? This book is first and foremost the story of the enginemen and their steeds which brought the steam era to an end on the Southern. It is therefore primarily about locomotive performance but enlivened by stories about how that was achieved and also about the band of young men who followed the exploits of men and machines, day and night over those last two years. It includes a substantial contribution from an ex-Nine Elms fireman and many anecdotes about the enginemen. The book contains about eighty train running logs plus records of lineside observations, detailed descriptions of the work covered by the locomotives and crews from the various steam motive power depots, copies of the actual duty rosters posted at Nine Elms, together with a unique collection of about 150 black and white and colour images taken in the 1965 to 1967 period covered by this book. It is the most comprehensive story of those last few years yet produced, and it is truly ‘The Untold Story’, a fine tribute to the enginemen who performed near miracles with their doomed and run-down fleet of locomotives, in the very different world of the mid-1960's railway, unequalled anywhere else in Britain. A tribute to the achievements of the Bulleid Pacifics and the men who worked on them: it is also worth recalling that no fewer than thirty of these Pacifics are still with us in 2018. A comprehensive story of the last two years Southern Steam, a fine tribute to both Bulleid's designs and those who drove them and a volume well worth buying. This engaging publication is well illustrated. Recommended particularly if you are a Southern Steam aficionado. An in depth account of the enginemen and workings in the last days of Southern steam with train logs, 150 photos and anecdotes about the train crews and their achievements. There were 100mph timings not long before steam ended, quite an achievement with engines nearly worn out. Through the descriptive text and good selection of black and white, and colour photos, the reader gets to know some of the footplate crews and the dedicated group of enthusiasts that made this fascinating book possible. Very much in the style of Don Don, the book is a diverse set of stories and archives unified by the same thematic line, decay and end of steam locomotives in the southern region of England. A curious, interesting and instructive book. One of the best accounts of those days I have ever seen. Pleased to note that I was on at least 85% of the runs listed! Off all the books covering the end of Southern Region Steam, this is by far the best and well worth the 50 year wait. Yes, it does lean towards Nine Elms and its crews exploits but as someone who from 1946 to September 1967 lived a 100 yards from the Footplatemen's entrance to 70A I'm bound to have a little bias. This is a masterpiece of detailed observation based on almost full-time participation in the last years of Southern Steam. It is written from the perspective of someone who was obsessed with travelling behind steam locomotives and wanting to record in detail their performance, particularly speed. As such it is a very personal account and it is also stuffed with detailed performance logs and data tables that make up about 40% of the very substantial 350+ pages. Some good photos and careful cross-referencing make for a very enjoyable and interesting read, but it is quite specialised. If you were around the Southern Steam Scene in 1964-67 and a regular timer or photographer, this is probably essential reading! As someone who was present at the end of Southern steam, living next to the mainline at Beaulieu Road station in the New Forest, I can confirm that this book is truly superb. I have written several railway titles and many magazine articles in the likes of Steam World, Hampshire County Magazine, the Echo newspaper etc., so I can speak with some authority, this book is OUTSTANDING. 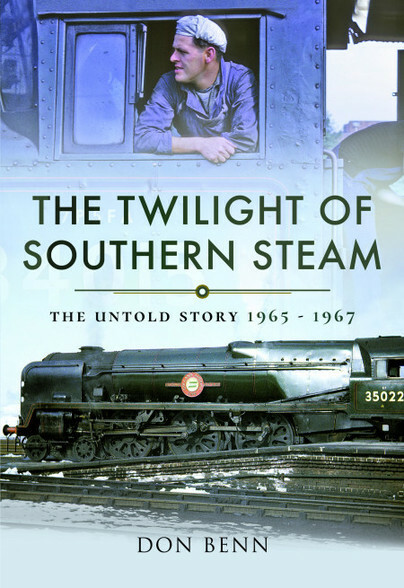 Without doubt, The Twilight of Southern Steam, the untold story 1965 - 1967 by Don Benn, will be a landmark publication. It is the most in-depth study ever undertaken, packed full of accurate logs and statistics. The book is superbly illustrated with high quality pictures and the captioned are fully detailed. This is a book that anyone who loves Southern steam will wish to dip into again and again. It is full of human interest and anecdotal material that is accurate and amusing. As one who knew many of those mentioned, I can confirm that every word is true. My house has a railway railway library containing many thousands of books. This book will shine out as the best in my collection. I can recommend this fantastic railway book to all fellow steam railway enthusiasts. You will not be disappointed - totally brilliant! Congratulations to Don Benn. This book will forever be my favourite. Andrew J Britton - Author of the Once upon a Line book series, OPC, Ryde by Steam, Medina Books, Waterloo to Weymouth a journey in Steam, History Press and Steam World and Steam Railway magazines contributor. The author was born in south London and developed a love for railways and steam locomotives at an early age. Most of his career was spent in the transport industry, both public and private sector, including ten years owning and running his own bus company. The author spent many hours covering the end of Southern steam and, following this, chased down the remaining steam in Europe between 1970 and the early 1980s. Since retirement he has worked part time for two transport companies and writes a monthly column for a railway magazine. He often travels across Britain and Europe in search of steam.